The goal of marijuana industry is to displace alcohol as a safer and healthier alternative. The beer industry is keeping close tabs on the growth of legalized marijuana in the US, and for good reason: The cannabis industry is gunning to displace alcohol as a safer and healthier alternative. Beer already competes with wine and liquor for what some analysts cutely refer to as “share of buzz,” but with recreational use of marijuana legalized in four US states—and as many as six voting in 2016 on whether to join them—competition stands to toughen. Marijuana sales have been on the rise, though are still dwarfed by beer, which brings in more than $101 billion annually. 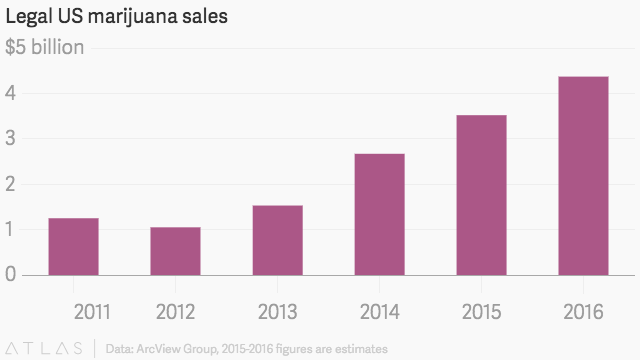 In 2014, marijuana sales clocked in at $2.7 billion, a 74% increase from 2013. By 2019, sales are estimated to increase to $10.8 billion, according to Nomura. Analysts with Nomura attended the Beer Industry Summit this week (Jan. 25 and 26) in New Orleans, and report that the rise of marijuana was among the major talking points there. They predict that the beer industry will lose at least some of its share of buzz to marijuana. There’s still a lot of data to collect before we know whether people in legalized markets are indeed substituting marijuana for beer, or whether one is definitively a healthier—or at least less unhealthy—option than the other. Still, many are already making the case for marijuana. “If people are replacing some amount of alcohol with cannabis consumption, it is a net positive for public health,” says Taylor West, of the National Cannabis Industry Association. Should her argument pan out, it would be good news for the cannabis industry, which could use any evidence showing health benefits as an extra arrow in its quiver when making the case for legalization. Still, it’ll probably be a long time before the beer industry has to seriously worry about people skipping pints for joints.